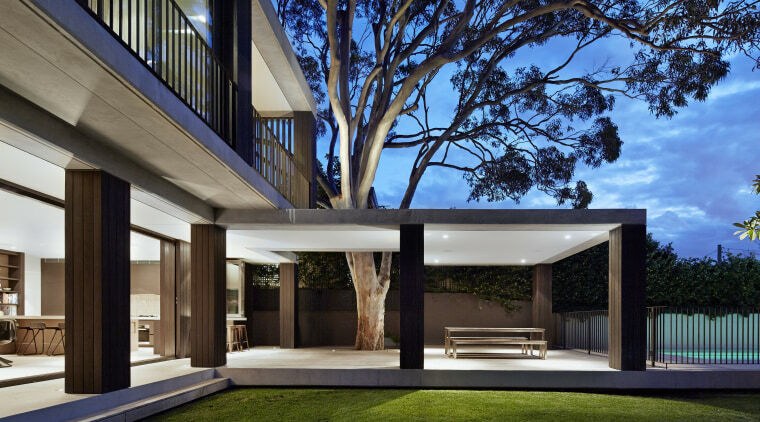 Offering a point of difference to the solidity of the brick and sandstone house it connects to, this glass-walled extension is designed around the sites large mature gum tree. It's a scenario often faced by architects how to most effectively add spacious, contemporary living to an historic home. Sometimes, a clear divide is best for the old, and also for the new. 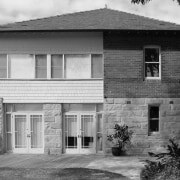 The renovation and expansion of this family home with a heritage-listed facade was undertaken by BE Architecture. Together with reworking the interiors of the sandstone and red-brick house, BE directors Jonathon Boucher and Andrew Piva were asked to add an extension and pool on the sloping rear of the site. 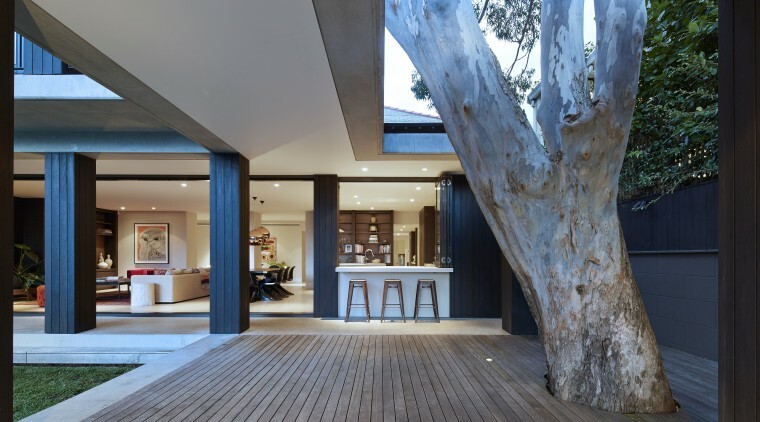 The extension had to embrace a beautiful lemon-scented gum on the property and provide seamless indoor-outdoor flow, says Boucher. 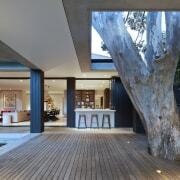 "The two-level addition is built on a floating slab of off-form concrete with timber infills bridging the root structure of the ancient tree. "Strategies were made in conjunction with an arborist to ensure the tree and root system weren't harmed during the tricky construction." In terms of layout, the ground floor of the addition comprises a large pavilion containing the open-plan living, kitchen and dining space. "The top floor on a level with the main upper floor of the existing house has the new master bedroom suite," says Boucher. Seen on this plan of a comprehensive renovation project, the front door positioning is now in the middle at the side of the extended home, allows guests to arrive straight at the heart of the interior. 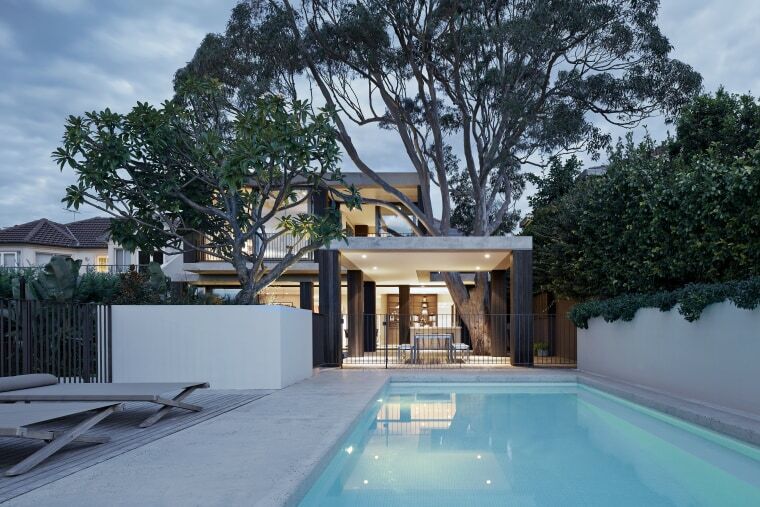 The existing home is to the left, while the glass box modern addition to the right contains a new kitchen, dining and living pavilion, plus extensive covered outdoor areas. To connect the old with the brand new, the architects inserted a central circulation atrium that defines and celebrates the different sections. The formal entry was moved from the front of the home to this bisecting void, says Piva. From the side, guests now enter directly into the heart of the home, while the original front door now opens to a new front yard garden. 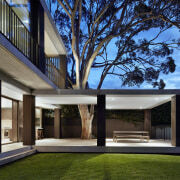 The extension is mainly glass but sections of inky spotted gum cladding contrast with the red brick on the existing home. The same finish is repeated on the support posts, which echo and complement the look of the tree trunk and its branches. 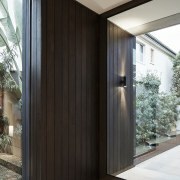 The posts conceal internal services,keeping the overall look uncluttered. "And the cladding materials are brought inside, too seen, for example, beside the new entry door where the spotted gum cladding is continued into the hall," says Boucher. 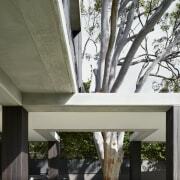 The lines of the pavilion base slab lead the eye out past the glazing to the covered deck and views beyond. 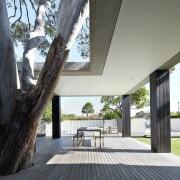 And with the sliding doors pulled back, the living spaces, pavilion deck and pool become one. 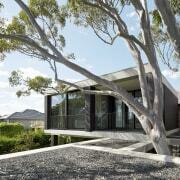 This glass-walled extension now comprises the reworked homes contemporary living spaces. This arrangement gives the impression that the pavilion space is even larger than it really is. "Stepping the swimming pool and storage spaces down the hill, enabled us to keep the pool surface flush with the deck," says Piva. "And a new garage is positioned another level down again tucked under the pool and rear lawn. 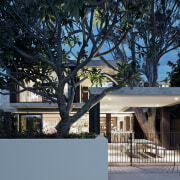 The project involved extensive excavation." The upper level of the extension cantilevers over the lower floor, with its deck stretching out to access harbour views previously unavailable to the owners. The roof was extended, too, making it more like a landscape element. In addition, the design incorporates passive heating and cooling to minimise power needs.